…wow. How did that free promo day go? Well, let me give you some figures. The number of free downloads of my second book was more than triple the combined number of purchases of my first book and my second book before that day. Enough people downloaded it that it was ranked in the top 40 free Kindle downloads in its genre during its one day promo. Amazon’s rankings have the top (however many) paid side by side with the top (however many) free books within the genre, so I had the good fortune at one point during the day of looking at the rankings and seeing that while I was #54 (free), three of the Wheel of Time books were #55, #56, and #57 (paid). 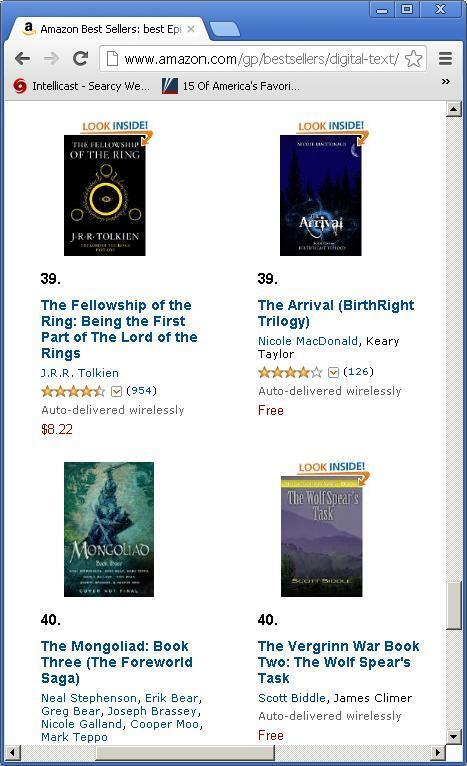 I then got to see myself at #40 (free) with LOTR: Fellowship of the Ring at #39 (paid). I know it is apples to oranges, but it did me some good to see my book side by side with books and authors like those. I also sold some copies of my first book today, presumably to folks who were downloading book two for free and decided to take a flyer on book one for 99 cents. Overall, I am pleased with the results and will likely do this again. If 10% of the folks who downloaded it for free like it and decide to read more, I will have grown my readership by over 30%. Since I have not yet found somebody who has read either of my books and said “What a piece of junk!” I am confident (or is it arrogance?) that folks who read this will like it and want to know how the story continues. Overall, I recommend that folks try this out for themselves if they are self-publishing and new to this. Yes, it represents a lot of royalties that I don’t get off those books, but it also represents readers who may never have even picked up one of my books without this opportunity. By my calculations, 70% of $0 * lots of readers works out to the same money as 70% of $2.99 for 0 readers, but in one instance you get lots of readers with no initial royalties and in the other you get no readers with no initial royalties. Doesn’t take an MBA to figure out the better long term business model.